70 Graphic Triangle Blocks, 11 Bold Samplers. Bonus Full-size pattern sheets included. 70 Graphic Triangle Blocks, 11 Bold Samplers. Bonus Full-size pattern sheets included. Ready to take the triangle challenge? 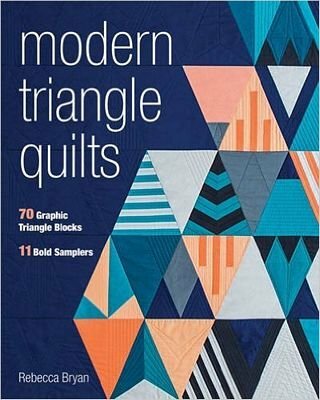 Choose from 70 pieced modern triangle blocks and 11 exquisite quilts that wow! Fourth-generation quilter Rebecca Bryan is back, this time with beautiful 3-sided blocks sewn from pieced stripes, chevrons, curves, and more. A dedicated graphic design chapter will help you choose a winning color palette, play up unexpected elements, and achieve balance and symmetry. Grab your favorite ruler and the full-size block templates to create equilateral, isosceles, and right triangles with ease. With no tricky seams, these sampler blocks are perfect to mix and match. 112 pages plus pattern pullouts, color, 8x10in, by Rebecca Bryan, Published by Stash Books (C&T Publishing).